Brisket is the meat of choice for barbecuing in the great state of Texas. In fact, Smoked Brisket is considered the “National Dish of Texas.” Briskets are a very tough piece of meat and difficult to eat unless it is cooked at a very low and slow temperature. When it’s cooked properly, a brisket will be “fall apart tender and delicious.” Smoking a brisket takes a lot of time and effort – but it is well worth the time as the final results are nothing less than spectacular! In the United States, barbecuing is an outdoor social event that involves more than just eating. It is an opportunity for people to gather around to watch the meat cooking, smell the smoky flavors drifting in the air, and enjoy good company. Good barbecues will always lead to a great gathering! Keep in mind that smoking meat is considered more of an art and is not a precise science. This method of cooking meat requires practice and patience. Good barbeque cannot be rushed. So pop open a cold beer and invite some friends over to visit. Brisket recipe and photos courtesy of Brenda Weller of Hillsboro, Oregon. Brisket is the cut of meat from the lower chest of the cow which contains a lot of connective tissue. This cut of meat must be cooked properly in order to tenderize the connective tissue. According to the Random House Dictionary of the English Language, Second Edition, the term derives from the Middle English word brusket which comes from the earlier Old Norse brjk meaning cartilage. In its earliest cooking form, to preserve the meat, colonial ancestors would cover brisket with salt crystals and age in a cool place for four days, creating what is known as corned beef which is still enjoyed by many today. In the United States, brisket was considered a useless cut of meat that was ground up for chili’s, stew, or just thrown out for animal feed. The ranch owners would keep the best cuts of meat from the cows for themselves and the ranch hands would get the useless cuts of meats. This is how beef brisket became a meat staple in Texas. It was not until the 1950’s when German butchers put brisket in a smoker and cooked over low, indirect heat to create today what is known as Texas barbecued brisket. In most barbecue lots in Texas, brisket is served on a piece of butcher paper and accompanied with sausage. As the Spanish explorers arrived in the new world, they found the indigenous people of the Caribbean preserving meats in the sun. To keep the meat from spoiling and getting infested with bugs, they would build small, smoky fires and slowly cook the meat on racks above the fires. The natives of the West Indies called this process “barbacoa” which is generally believed to be the origin of the modern word Barbeque. “American barbecue is the modern day evolution of cooking meat outdoors. As Europeans and Africans migrated to the Southern region of the United States, the process of barbecuing evolved. Europeans shipped over pigs and cattle to the new world to feed the colonies. In the South, pork became the meat of choice since pigs required little care. Instead of drying meats on racks, pits and smoke houses were used. The process of slow cooking and smoking meats to achieve tenderness and flavor was used for the poorest and toughest cuts of meats that were left for slaves and lower income people. In the south, barbecue became an inexpensive food source. Check out all of Linda’s Beef Recipes using various cuts of beef. As you research and talk to people about smoking methods for brisket, you will find varying opinions about the proper way to smoke a brisket. 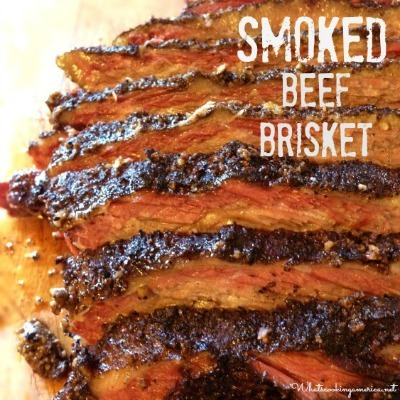 My son-in-law, Ben Weller of Hillsboro, Oregon, loves to smoke briskets, and after much practice, he has developed his tried and true technique for a tender, juicy brisket. Large cuts of brisket can be easily found in a restaurant supply grocery store. Look for a piece of brisket that is dark red in color, feels tender, and springs back to the touch. It is not recommended to use brisket that has been frozen as the the meat will not turn out tender when cooked. If the brisket feels stiff or flops over, then it’s a good indicator that it was previously frozen – do not purchase. Look for a brisket that has a good layer of fat at the tip of the brisket (this is called the fat cap) and you also want to see that the fat is marbled throughout the entire cut of brisket. Look for a brisket that is laced with fat all over, as it will cook to fall-apart tender, which is the result that you want to achieve. The fat should appear bright white in color. If it has a yellowish appearance, then it’s not a fresh cut of meat. It is recommended to buy a brisket between 8 to 12 pounds to feed a large group. Any smaller than 8 pounds, and the brisket will cook too quickly. Calculate about 1 pound of meat or more per person. Start preparing the brisket the day before you plan to barbecue. Trim down to 1/4-inch to ensure the smoke is able to penetrate the meat. If the fat cap is too thick, the brisket will not cook evenly. If the fat is completely cut off, you will lose the flavor. The surface fat and the marbling melt as the brisket smokes, marinating the meat and keeping it moist. If any bits of muscle seem grey or dry, cut them off and discard. You can soak the brisket in a marinade or use a mix of spices to rub into the brisket to help tenderize the meat. With either method, it is recommended to let the brisket sit in a marinade or rub overnight, in the refrigerator, to tenderize. My son-in-law likes to rub a spice mix into the brisket and then inject with a brine that will leave the meat both tender and juicy. Grind up the salt, peppercorns, and steak seasoning until they reach a fine powder consistency. The grinding can be done using a few different options – by hand using mortar and pestle, with a coffee grinder (cleaned out) or a small blender can be used. Place the brisket in a roasting pan fat side up. Rub olive oil over entire brisket until evenly coated. The olive oil will help the spice rub mixture cling to the meat and the spices will penetrate better while cooking. Rub the spice mixture into the brisket until the entire brisket is covered with the rub. If more rub is needed to cover meat, then make another batch of rub. It is important to make sure the entire brisket is completely covered with the spice rub mixture to help seal in the juices and add a wonderful flavor to the meat. The key is to use equal amounts of ingredients in this rub mix. In a small bowl, add beef bouillon. Pour hot water over beef bouillon and stir until bouillon is dissolved. Make sure your Marinade Injector (which looks like an over sized syringe) is first washed out and rinsed before using. Place the needle of the injector into the brine and gently and slowly pull up on the plunger. Next, insert the injector needle into the brisket and push down on the plunger to distribute the brine deep into the meat. Repeat this process covering all sections of the brisket. Place the brisket (in roasting pan) in the smoker and close the smoker lid. Smoke the brisket for 1 hour for every pound of meat or smoke overnight. As the smoke is penetrating the brisket meat during the smoking phase, it will build up a pink smoke ring around the outer edges of the brisket. Turn up the temperature of the smoker grill to 180 degrees F.
Pour 1 1/2 to 2 cups of apple cider or apple juice into the roasting pan until entire bottom of roasting pan is covered with the liquid. Insert the meat thermometer probe into the center of the brisket. Cover the pan with two (2) layers of aluminum foil and make sure the foil is tightly sealed around the roasting pan. This will help trap the moisture around the brisket so it can steam during the cooking process to keep it moist. Let the cable of the meat thermometer probe hang outside the smoker and close the smoker lid. Cook the brisket up to an internal temperature of 200 degrees F. and maintain this temperature in the meat for several hours while cooking. This low heat will help break down the tissues in the meat to tenderize while cooking. Not all briskets are created equally, so the cooking time will vary. This final stage of cooking the brisket can take four (4) hours or more. Do not raise the lid of the smoker any more than you absolutely need to (it reduces the temperature inside every time you do). It is important to use a meat thermometer with a cable attached to the meat probe tip. This will allow for the meat probe tip to stay in the brisket during the entire cooking process while the barbecue lid is closed and give you a continuous temperature reading of the meat to ensure it does not overcook. I recommend using the Thermoworks Smoke Pro Series 2 Channel High Temp Cooking Probe for continuous monitoring of the meat’s internal temperature in addition to monitoring the smoker’s internal temperature during the smoking and cooking process. Includes wireless receiver to remotely monitor the temperatures from up to 300 feet away. Troubleshooting tip: If the internal temperature of the brisket starts to rise over 200 degrees F., turn down the smoker temperature heat if you are not yet ready to serve. If the temperature of the meat does not cool down to 200 degrees or lower, then turn off the smoker! You will need to constantly monitor the temperature of the brisket while it is cooking. Take the brisket off the smoker at least 30 minutes before your ready to serve. Remove the brisket from the roasting pan and let rest at least 30 minutes to keep the juices in. Do not slice until the last possible minute. Brisket dries out quickly once it is cut. When ready to serve, using a sharp knife, slice/carve brisket against the grain. Working from the thin, square end of the brisket, cut long thin slices about the thickness of a pencil. If the brisket is a little tough, cut it thinner. If the brisket starts to fall apart cut the slices thicker. As you work your way along, trim off any large pieces of fat and discard. Collect any juice and pour it over the sliced meat. The brisket can be served alone or on sandwich buns. If you do not have the means to buy a smoker, a smoking effect can be achieved using a grill. Use the “indirect” heat method of cooking on a grill, by pushing all the coals to one side of the grill, or if using a gas grill, only light one side of the grill. The brisket should sit on the side of the grill with no fire underneath. Soak hardwood chips in water for at least one hour and place over fire. These will product the smoke to flavor the meats and add the moisture to keep the meat from drying out. Add a drip pan below where the meat will sit, to catch the fat that will be dripping off the meat. Try to maintain a grill temperature as close to 200 degrees F, as possible. Baste the meat while cooking to keep the meat moist and add extra flavor. Try not to baste more than once an hour since you will lose smoke every time the grill is opened. Answer – Per Ben Weller: Smokers are not like an oven where you can lock in the temperature. 180 degrees F. is a typical low heat setting for most smokers some brand of smoker may vary slightly so you have to play around with the temperature setting. With that said, even though the heat for the smoker is set at 180 F., the internal temperature of the smoker can easily get hotter from the fire causing the temperature of the meat to rise beyond 180 degrees F. while cooking. That is why it is critical to constantly monitor the internal temperature of the brisket to ensure it does not rise above 200 degrees F. so it cooks low and slow. The brisket is done when the meat is fall apart tender. If the internal temperature of the brisket starts to rise over 200 degrees F., turn down the smoker temperature heat if you are not yet ready to serve. If the temperature of the meat does not cool down to 200 degrees or lower, then turn off the smoker! You will need to constantly monitor the temperature of the brisket while it’s cooking. Every smoker can vary in temperature settings. In our example, we are using a pellet grill smoker. We set the smoker to 180 degrees F. for the final cooking process, but the internal temperature of the smoker with the lid closed can produce a higher heat which will cook the brisket up to 200 degrees F. You will have to play with your smoker grill temperatures to find the setting that works best that will bring the meat temperature up to 200 degrees F. There is some debate that the smoker temperature needs to be between 200 to 225 degrees F., but if your brisket temperature starts rising over 200 degrees F, then turn down the smoker temperature. Remember the cooking process must be “low and slow”. I have several issues with this recipe. Maybe it’s a typo! But if your cooking at 170f and finishing at 180f. How in the world do you expect the meat to get to “200f”. Not to mention at 170f it maybe in the danger zone below 140 for more than 4 hours. Also 8# is a mighty tiny brisket. Most packers I see are in the 12 to 16# range. You are also finishing in a pan of liquid, I call that braising. Not something I would do. Maybe some burnt end’s from the point, but not the flat. Wouldn’t that ruin the bark. It’s no typo error. Per our troubleshooting section the following is explained: Smokers are not like an oven where you can lock in the temperature. 180 degrees F. is a typical low heat setting for most smokers some brand of smoker may vary slightly so you have to play around with the temperature setting. With that said, even though the heat for the smoker is set at 180 F., the internal temperature of the smoker can easily get hotter from the fire causing the temperature of the meat to rise beyond 180 degrees F. while cooking. That is why it is critical to constantly monitor the internal temperature of the brisket to ensure it does not rise above 200 degrees F. so it cooks low and slow. The brisket is done when the meat is fall apart tender. The key to smoking a brisket no matter what size the meat is to constantly monitor the internal temperature of the meat with a good thermometer probe you can keep in the meat. Having never smoked anything before I used my friends pellet grill to do a brisket. I tried to follow your recipe as close as possible and it turned out fabulous!! Had some friends over and they had brisket in Texas while hog hunting and they raved about the way mine turned out. They said it was tastier,more tender and more moist than they had ever tasted Hats off to you!!! What about the old adage to wrap the brisket tightly and then rest it in the cooler?